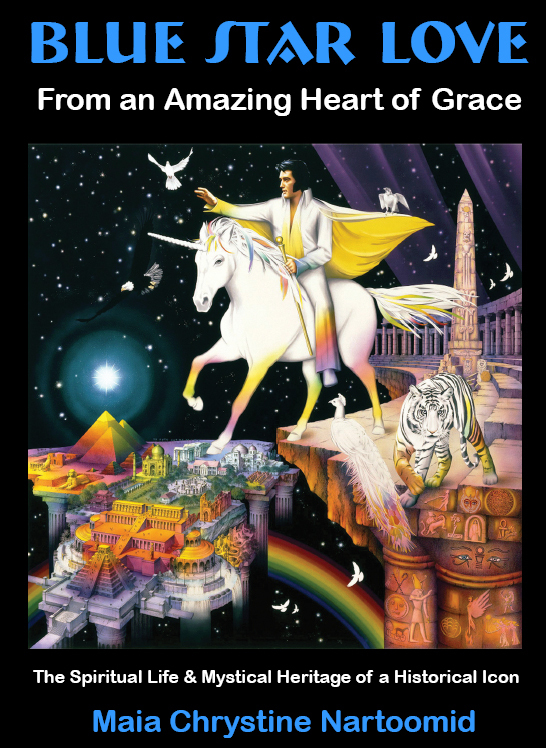 BLUE STAR LOVE ~ From an Amazing Heart of Grace (486 pages), addresses Elvis Presley as a spiritual being who had a life-purpose far beyond entertaining. He used his God-given talent and his desire to share it with people as a means to spread the greater Light within him into the world. A significant portion of “Blue Star Love” is taken from transcribed telephone conversations between Elvis and Wanda June Hill–one of Elvis’ “phone friends” whom he knew for the last 15 years of his life. Also included are transcripts of taped lectures Elvis gave in his home (which various people present informally recorded) and letters and cards sent by him to Ms. Hill, her family and friends. This material (both vocal and written) has been validated as authentic, and some of the documentation is included in the book. In addition to Elvis’ own thoughts, “Blue Star Love” contains quotations from people of quite diverse backgrounds in which they express their profound feelings about a person who was much more to them than just an entertainer. Their statements form a testimony supporting the concept of Elvis’ special heritage and mission in life. Some of these individuals knew him on a personal basis, many did not, yet all saw him as a special personage endowed with the ability to help people from all walks of life transcend the barriers of their travail and reach for the stars of a brighter heaven. In addition, “Blue Star Love” contains Elvis’ basic numerology and his natal birth astrology. Also revealed are the striking similarities between Elvis as an archetype and both historical and mythological persons of ancient times. Wanda: You are really into all of that – spiritualism type of things, huh? Wanda: No, is it a country or a person? Elvis: A place, my home is near there – my other home – where I am from, and I have the Blue Star for my sun. I have eight moons and a mansion beneath the outer shell of my planet. You think I’m making this up, but its true – you’ll know that one day. You’ll remember what I told you – before you die – you’ll see some of it happen, and you’ll be involved because you and I are tied together and you don’t know it but I do. I can’t tell you how – I don’t remember it, but I feel it in my heart, in my inner self, and so do you. Why else are we talking about this? Why are you here? Why am I? I care about you because you are a part of my past as I am yours, and together it makes that tie in this life. Because of you and me things will happen – people will do things and have opinions and change minds and perhaps be more content, happier because of you and me knowing each other…that is life.